3 Ways To Find Items To Sell On eBayEliminate The Muda! Selling on eBay is a great way to earn extra money. In fact, there are hundreds of thousands of people earning a full-time income selling on eBay. What are you waiting for? One thing that holds back many people is the inability to find items to sell. While this is a common concern, it is not one that has to stop you from earning a regular income. 1. Volunteer to help others clean out junk from their home – as long as you get to take some things with you. Most people are more than willing to let you have what you want, if you help in the grueling labor. After all, they are just going to throw most of the items in the trash anyway. To get started with this idea, ask friends and family first. This way you can perfect your system, and get a better idea of what you are looking for and what the process entails. From there, do what you can to advertise your service and spread the word. Don’t overlook the benefits of taking out a small ad in a local newspaper. Although it may sound silly, there are many people that will take you up on your offer. 2. Become a garbage picker. Get this: every Wednesday night when people in my neighborhood put out their trash, the same person comes by, with his van, to see if he can find any valuable “trash.” Last week, while putting my garbage on the curb, he stopped and asked if I was throwing out anything that could be resold. Although I wasn’t, we struck up a nice conversation. He later told me that he makes $200 to $400 per week reselling items on eBay that he finds in other people’s trash. Imagine if you did the same? This may not be the most glamorous work in the world, but when the money begins to roll in, you will have a huge smile on your face. 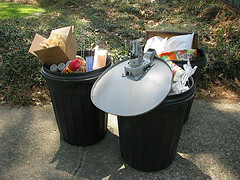 Remember this: somebody else’s trash can be your treasure. 3. Buy at thrift stores for cheap, and then list the items on eBay. This is a strategy that I have used time and time again to make a few extra bucks here and there. The great thing about this strategy is that you can visit several thrift stores in a short period of time after you map out an effective route. Additionally, these stores are always getting new items. If you visit enough, you are sure to find a few things here and there that can make you a pretty penny on eBay. For example, a few months ago I purchased two men’s sports jackets for $10 each. Two days later I resold both of them on eBay for $30 each, which represented a 200% return. For a few minutes of work, I made a profit of just around $40. If selling on eBay sounds exciting to you, follow the tips above. These tips will help you make significant sales and profits steady from an income source you had never considered before. Do you have any other tips for finding items to sell on eBay? Or any tips on the sale process itself to maximize your profit? When I buy new items I consider what their resale value will be on eBay. If you buy new electronics or high-end items, keep the original packaging and take good care of them, then you can resell them down the road and recoup some of the money you spent. I think #1 offers the best potential in terms of finding something valuable, while #3 seems to offer ways to make a quick profit on new items. A 200% return is something indeed. I sometimes sell sports cards on eBay. I usually just buy them in lots on eBay and then resell them individually. I wouldn’t recommend that everyone use this practice as you really have to know what to look for and/or what is a hot seller at the time. There are many items on eBay that are sold in lots that you can do this with, such as jewelry or coins in addition to sports cards.